The semi-annual Hongnong Elementary School staff field trip – an epic adventure in Korean cultural immersion, over two days. Jared – yours truly, a-bloggin’. Mr Moyer – the new “other” foreign English teacher at Hongnong, Casandra’s replacement. A nice guy. Ms Ryu – the English department head (direct supervisor) and a 3rd grade homeroom teacher. My favorite person at Hongnong. Mr Lee – the “vice-vice” principal (#3 in the school’s administration), a very kind and intelligent man, and a 2nd grade homeroom teacher (2-1). I like Mr Lee a lot. Mr Choi – An older 2nd grade homeroom teacher (2-3), who has been very kind an generous with me. Mr Kim – A 3rd grade homeroom teacher who will be retiring NEXT WEEK. He has been kind to me but I have sensed he’s not popular with the other teachers. He’s got some “short-timer” attitude and is very traditional. Also, he mumbles, and I’m not the only person who finds him hard to understand – the other teachers and the kids too, often have no idea what he’s going on about. Ms Lee (I think?) – the really kind preschool teacher whose Korean I find eerily easy to understand. Perhaps she’s realized that if she talks to me like she talks to her students, she can be understood for the most part – she talks very slowly and methodically, with a kind of sing-song rhythm, and enunciates those difficult Korean vowels very clearly. The Unnamed Characters (Korean culture can make it hard to learn people’s names. These are people I know and interact with by their roles or titles rather than by their names, although for many of them, if pressed, I could probably figure out their names). The Principal – the king, on his throne. The Elementary Vice Principal – the will to power. The Preschool Vice Principal – the always-smiling queen, with her many highly cute micro-minions. Actually, all the preschool leadership and teachers are much nicer, more fun, and less machiavellian, on average. Probably, this comes with the territory. The 6-1 Teacher – also the technology queen of the school, but she’s always so stressed out… so the school’s technology infrastructure suffers. Her English is excellent, however. Lately, since Haewon has left, she’s sometimes gotten stuck with translator duty, when Ms Ryu and Ms Lee (Ji-eun) aren’t around. The Preschool Administration Lady – I don’t even know her job title, but I think she’s #2 over there at the preschool. She helped me with my internet problem last spring. Of course, now, I have a new internet problem. Sigh. The 3-1 Teacher – one of the teachers I wish I knew better. I sometimes decide which teachers must be “great” teachers based on the collective behavior of their homeroom kids, and her class is one of my absolute favorites at Hongnong. The 4-1 Teacher – the school’s main music-person. Very cheerful and positive. And another great group of kids, too. The Social Studies Teacher – he’s a floater, like us English teachers – a kind of specialist with no homeroom. He’s a younger guy… I really envy the amazing rapport he has with most of the kids. I think he’s one of the most popular teachers in the school, with the kids, and he’s also extremely conscientious and kind-hearted with his fellow teachers. One of the new generation of Korean teachers that are of a very high caliber. The Male Preschool Teacher – this is so rare in Korea that often the school staff refer to him in this way, as if it were his title. He’s a really nice guy and although he doesn’t often show it because he’s rather shy, his English is quite good. The 4-2 Teacher (I think it’s 4-2 … one of the 4th grade classes, anyway) – this is the guy I would end up being, if I were a Korean. He’s full of rambling, intellectual trivia about history, science, culture, etc., and he will talk long after others have lost interest, but they keep listening because he’s also sometimes funny, not to mention the fact that he’s a nice guy. The New 5th Grade Teacher – she’s so young and small, she could pass for one of her students, and, being at the utter bottom of the hierarchy, she’s the recipient of a lot of crap and mistreatment by the other teachers. I don’t feel like I have any kind of interaction with her, but I feel sorry for her sometimes. The Quiet, Mysterious Administration Guy – he’s new, and seems to have replaced the man known as “the big-headed administration guy.” Or something like that, anyway. The Tall, Bitterly Resentful Physical Plant Guy – he’s the one I pissed off last spring, with my complaining. One of the reasons why I don’t really get along with the admin office people. A final note regarding the people: not all the teachers or staff attended. Many stayed away – and I understand their various reasons. But from what I’ve come to understand, staying away is only an option for those unmotivated, career-wise. So if you want to advance your elementary teaching career, you’ve got to play the politics, and that means coming on these kinds of trips. The trip started at 11 AM. 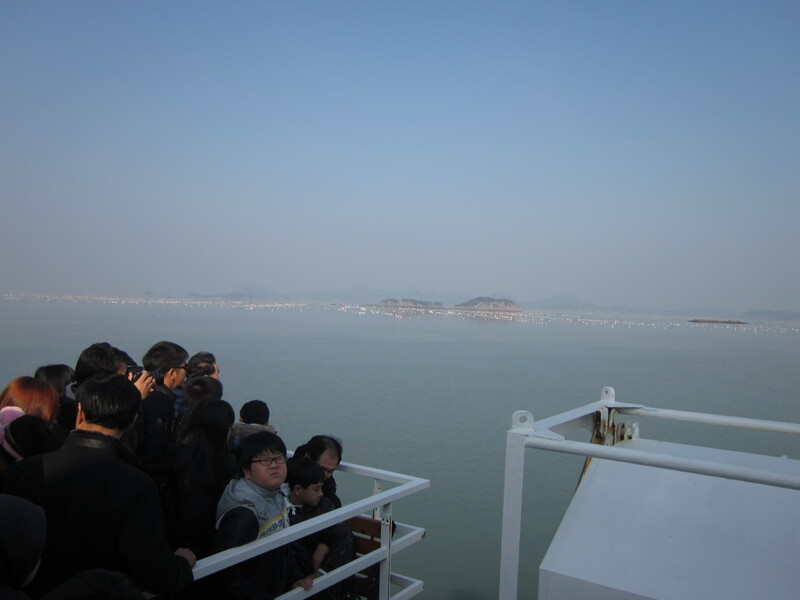 We piled onto a bus and drove off into the hazy, mountainous southern extremities of the peninsula. Snacks were passed out: tteok (rice cakes, both savory and sweet), almonds, beef and squid jerky (with dipping hotsauce), beer (I had one can). 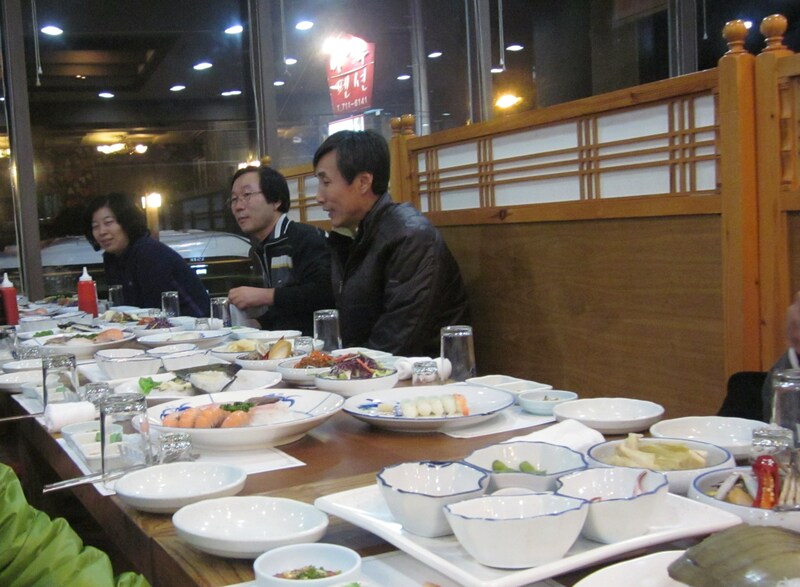 After about one and half hours, we arrived at a restaurant, somewhere between Naju and Jangheung. We ate saeng-go-gi (raw beef) and other delicacies. I avoided alcohol, except for one shot of soju (soju, for those uninformed, is Korean drinking ethanol, sort of vodka-like) poured by the vice principal. The 4-2 teacher discoursed at length, on subjects including local history, the evolution of Korean agricultural practices, Thomas Jefferson, architecure, King Sejong the Great, Julius Caesar, the Egyptian political situation, and other topics I wasn’t even able to identify. Listening to him is a bit like listening to someone reading out loud from the Korean version of wikipedia. I only understand about 15% of what he’s saying, though. But I enjoy it, nevertheless. When we finished lunch, we stood outside the restaurant while some of the staff smoked. 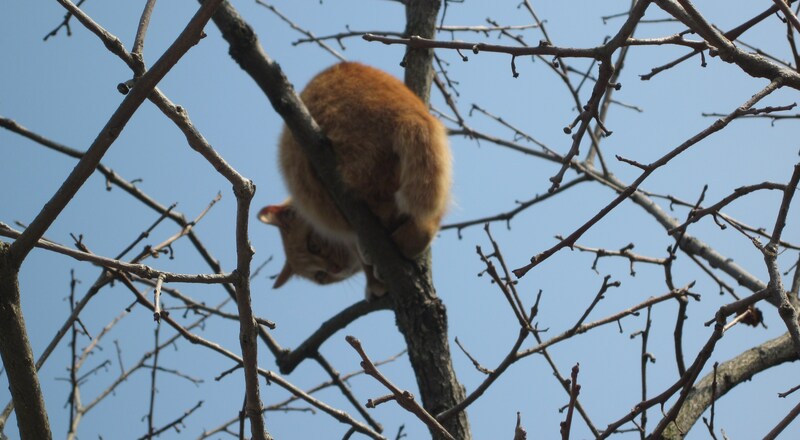 There was a cat in a tree. 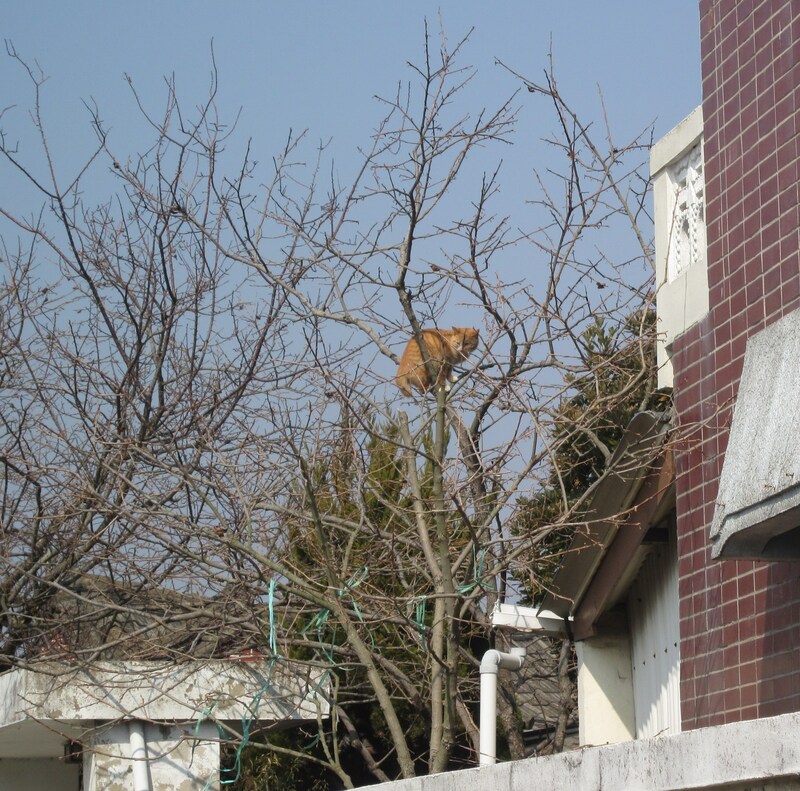 The principal, entirely deadpan, explained that this was a rare Korean cat-tree, and that the cat in the tree appeared ready to harvest. This is the first time I understood one of his jokes. 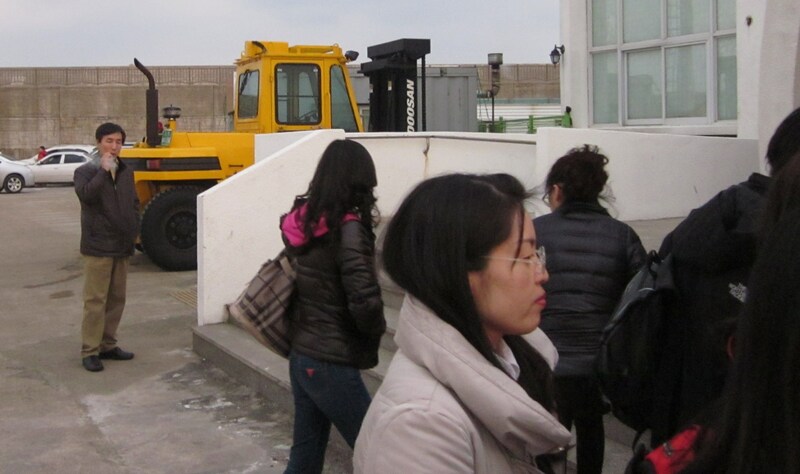 We got back on the bus and drove to the ferry terminal below Jang-heung. 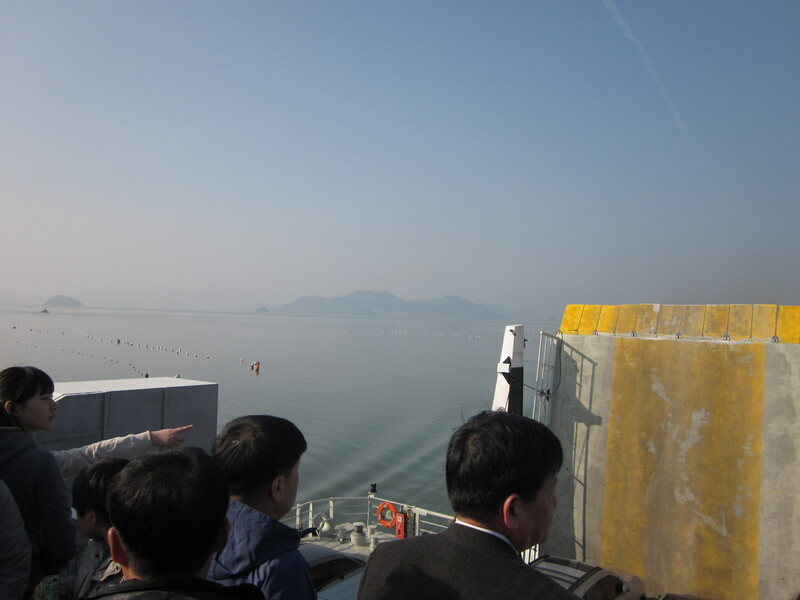 There’s a fast (hydrofoil) ferry that runs from there to the eastern tip of Jeju Island. The ferry terminal was very crowded, but our little group of people was well-organized, relative to the prevailing chaos. We boarded the ferry at about 3:30. 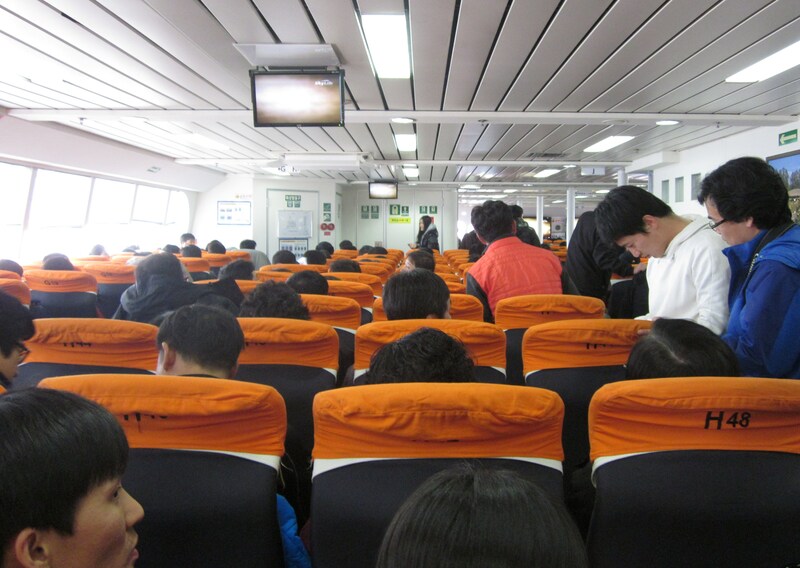 The ferry is one of those environments more amenable to mass transportation than to sightseeing. They only let us out on the deck for a short time, and ALL 500 PASSENGERS wanted to be out there. It was crowded. 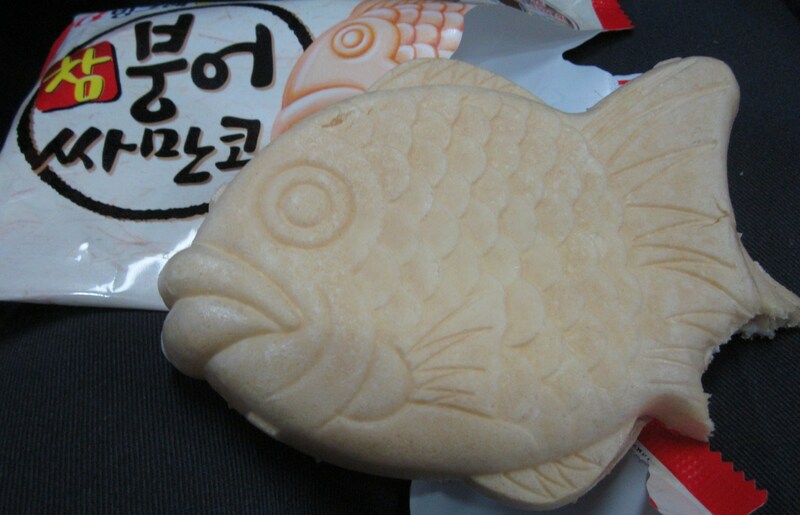 The Male Preschool Teacher bought and passed out ice cream sandwiches with bean paste (kind of like sugary refried beans, a Korean favorite), in the shape of carp. Some of the male teachers and staff began to drink in earnest. 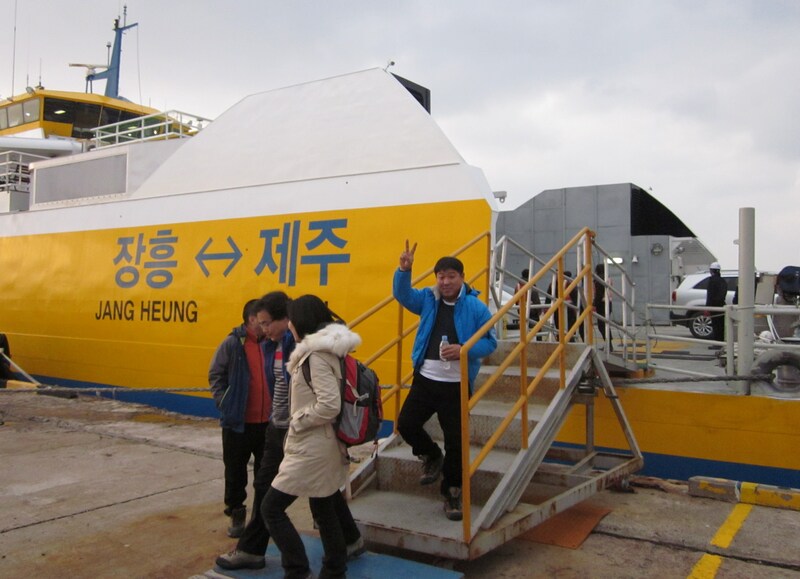 A lot of soju was consumed, and some of the other teachers got seasick – but only the Bitterly Resentful Administration Guy got both drunk AND seasick. There was general amazement at Moyer’s ability to consume alcohol – perhaps I’d let them to believe that all foreigners are weak pushovers. But no… it’s only me. We arrived at Seongsanpo around 6:30. Mr Song was waving and happy with his new-found friend, Moyer. The principal needed a cigarette. We got onto a new bus. We drove to a restaurant in Jeju City, about an hour west (a quarter of the way around Jeju Island, which is a little bit bigger than Oahu in area, but similar in its overall degree of urbanization, I would guess). The island is volcanic, and there was an extinct caldera hovering on the coast shortly after departing the ferry terminal. There are a lot of palm trees in Jeju, which strikes me an effort at horticultural fantasy on the part of the Koreans, for, although Jeju is at the same latitude as Los Angeles, it gets snow in winter even at sea level – I saw many patches of old snow alongside the road as the sun set. At the restaurant, we had a very traditional dinner of hweh (sashimi, with some sushi and other seafoodish things). 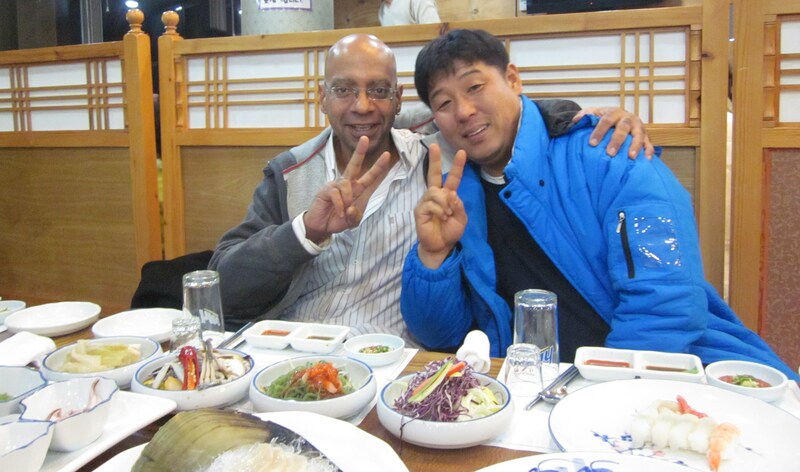 Moyer and Mr Song continued to drink soju. Many of the others were drinking heavily, but I only drank when required to do so by protocol (i.e. when the principal or vice-principal offered) and otherwise stuck to beer. I thus avoided getting drunk. The principal, vice principal, and the preschool leadership began hosting the long, drawn-out process of having the various members of the staff come and sit in front of them and offer and be offered shots of soju. It’s rather ritualized. Meanwhile, I spent some time talking earnestly with Ms Ryu, and subsequently Mr Lee, about my decision to not renew. I shared my “decision spreadsheet” in its final form with Mr Lee, and he was very thoughtful, but he felt I wasn’t being fair in how I had made my decision. He, and later Ms Lee (of the preschool, and unrelated – remember, Lee in Korea is like “Smith”), both felt that the most compelling argument for my staying was one of continuity – for the kids. And in that, I am very much in agreement. The worst moments came when I was ushered to sit at the table in front of the Principal, and he “talked” with me for a good 15 minutes, including many impossible-to-answer (almost zen-koan-like) rhetorical questions and remonstrances and possibly humorous cultural observations that failed to translate. One of the teachers with fairly good English (the 6-1 teacher whose name I always seem to forget) sat at my side and made some effort to translate as I got lost in his Korean. Most of the specifics of his speechifying were lost on me, but I remember some things. A lot of it seemed to be, obliquely, about the fact that I wasn’t renewing at the school. He asked me repeatedly if I was able to understand “Korean culture,” only to repeatedly trap me in such a way that it was clear I did not, based on my failure to say the right thing to his questions or requests. He said he thought foreigners can never understand Korean culture, but offered few hints as to why. He did discuss the “we” not “I” issue. He told me that as far working in a Korean school, “it’s for the children” – but I could hardly argue with that although so much of what they do (from my perspective) seems to forget children are even around. Things are structured so differently. He complained that in fact, English is NOT important. It’s not a global language, he insisted. 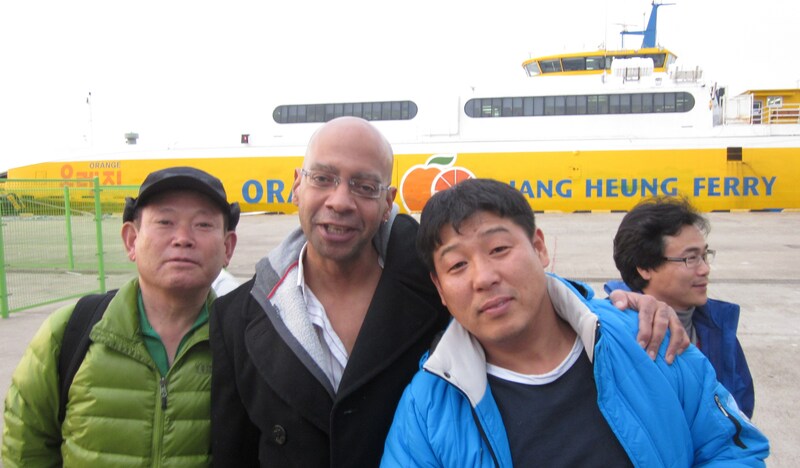 He expressed some xenophobic commonplaces about what “foreigners” and specifically Americans are doing in Korea. And his conclusion: “Jared: Go home” – this last in English. Actually, given his age and geographical origin, I can easily imagine that 30 or 40 years ago, he stood in some anti-government protest and shouted this exact phrase at some gathering of American diplomats or US Army personnel. Anti-Western sentiment runs deep, in “red” Jeolla. Context: He was very drunk. He always gets very drunk at these gatherings. Several teachers (including the one translating at my side and Ms Ryu, later) offered that as an excuse for his rhetoric. But I’m one of those people who believes, strongly, in the aphorism, “the drunk man reveals the truth in his heart.” The principal showed his xenophobe credentials plainly. Not that I wasn’t already aware of them. And that’s that. Some people in Korea are xenophobic, and there’s very little that I can do, as a foreigner, except avoid those people and focus on the rest – don’t try to imagine you can change a xenophobe’s mind through some combination of argumentation or behavior. I don’t think it’s possible. Afterward, Ms Ryu began a song-and-dance of excuses, seeing the damage the principal’s behavior had done to any vestigial will to renew that I might have had up to that point. As she points out, it’s complicated. He’s not an unkind man, clearly, in his rigid, paternalistic, Korean-traditional fashion. He likes children, which is good to see in a school principal. He’s charismatic, which is great to see in a school’s leader. Ms Ryu tried to tell me that the principal tended always to say the opposite of what he desired or believed, to those under him. For example, he would tell her that she did a bad job when he thought she did a good job, or that when he would tell her not to worry about something, this meant it was important. At some simplistic level, I might see this as being true. As an explanation that he presumes a kind of obstinacy in those around him – such that he is always compelled to operate on the assumptions of reverse-psychology… well, this struck me as more a coping mechanism on her part than anything with even a grain of real psychological truth in it. Hence, ultimately, the idea that by “Go home” he meant “stay” is patently silly – it seemes to be grasping at straws. No. He said “go home,” and that’s exactly what he meant, from the depth of his Korea-loving heart. Needless to say, I felt depressed. I wasn’t extremely drunk, but I wasn’t sober, either, and everyone knows, I’m not a happy drunk. I’m a moody, grumpy drunk. So the principal’s words combined with that factor to produce a very gloomy feeling for me. I lay down, and listened to my three roommates in my hotel snoring in synchrony (well, only after several had stayed up for several more hours still, playing poker and eating and drinking yet more). I didn’t sleep well – Korean hotel rooms are always over heated, which I cope with when alone by opening windows, but with Korean roommates, this is not really an option. Perhaps for the first time in more than a year, I found myself meditating on the possibility of simply giving up my quixotic “Korea project” and moving on to something else in life.